The General Motors ELECTROVAN is the first Hydrogen Fuel Cell prototype unveiled to the public. The event dates back nearly fifty years ago, on October 28th 1966. It happened at the General Motors Technical Centre at Warren, Michigan in the U.S.A. It was a Press Conference opened by Edward N. Cole, Executive Vice President of the General Motors Corporation at the time. He was assisted by a staff of Researchers who participated in this huge program initiated in 1956 and investigating a wide variety of energy conversion alternative to the gasoline internal combustion engine. "This meeting is a milestone event and the presentation is focused on state of the art on electric vehicles with the battery electric ELECTROVAIR II and the hydrogen fuel cell ELECTROVAN prototype as running examples" announced Edward N. Cole in his introduction speech. We are reproducing some excerpts of presentation conferences during the Warren Technical Center Conference and allow a better understanding of the situation nearly 50 years ago. After ten year of investigations in alternative power source for personal mobility, the General Motors Technical Research Staff introduced two electric drive prototypes based on existing gasoline engine current models. The scope of investigation concerned electric drive running prototypes with similar passenger capacity and operating performance compared to the gasoline engine equivalent vehicles. Both vehicles were equiped with electric drive components of similar 100 peak horsepower and a range factor of 27 horsepower-hours. It was found that at least 400 Volts and 300 to 400 amps would be required for the electric system. One prototype is the battery electric ELECTROVAIR II with silver-zinc batteries capable of an operating range of 40(65 km) to 80 miles(130 km) between recharge and at an exorbitant cost. In a lead-acid system providing the same 27 horsepower-hours, the batteries alone would weigh about four times as much and the system would require about three times the space. The ELECTROVAIR II weight 3400 lbs. 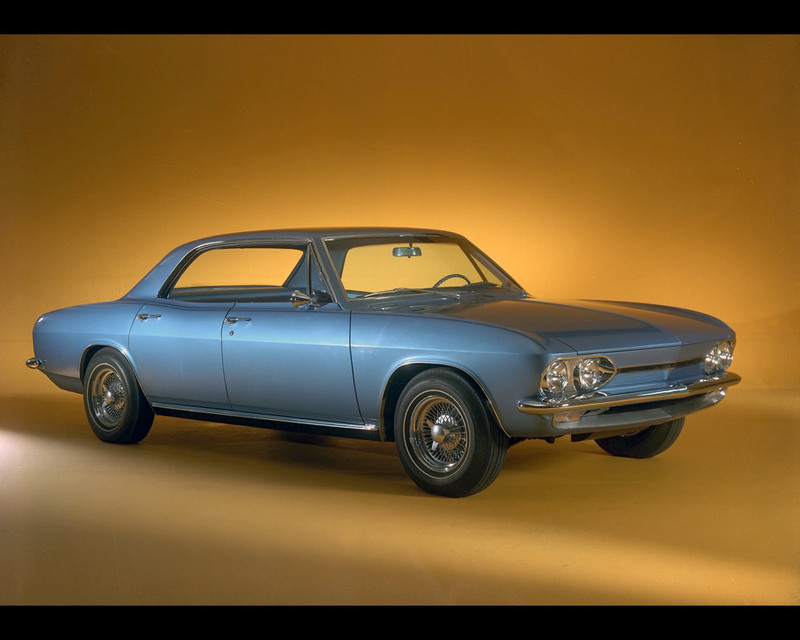 (1540 kg) with 1230 lbs (558 kg) power train weight while current gasoline CORVAIR weights 2600 lbs. (1180 kg) for 610 lbs. (276 kg) power train weight. 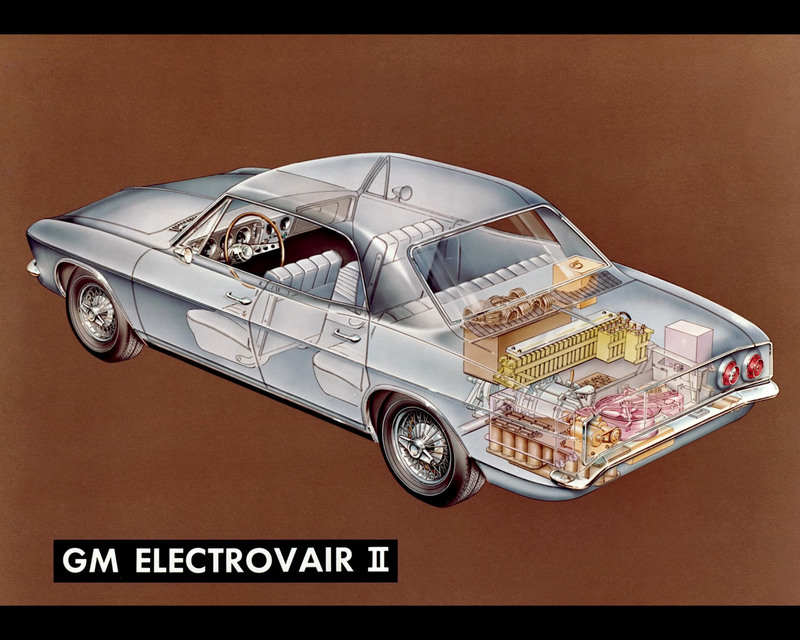 Both automobiles would accelerate from 0 to 60 mph in 16 seconds and top speed is announced at 80 mph (128 kph) for the ELECTROVAIR II and 86 mph (138 kph) for the CORVAIR. The limited range of the battery electric ELECTROVAIR called for investigating hydrogen fuel cell as an alternate energy source. The battery is a system where the fuel is stored within the energy converter itself, and which has the feature of being electrically reversible or rechargeable. The fuel cell is a system where the fuel is carried in tanks and burned electrochemically in the energy converter. 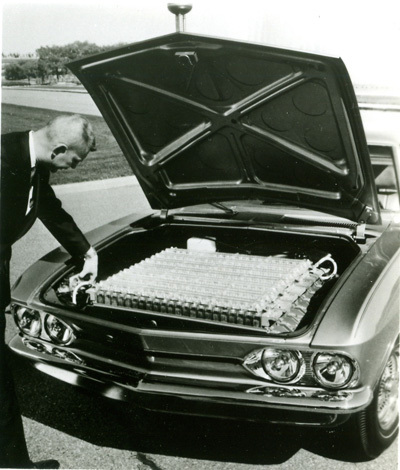 This time the energy source did not fit in the current Corvair sedan mainly because of the size of liquid hydrogen and liquid oxygen storage vessels. 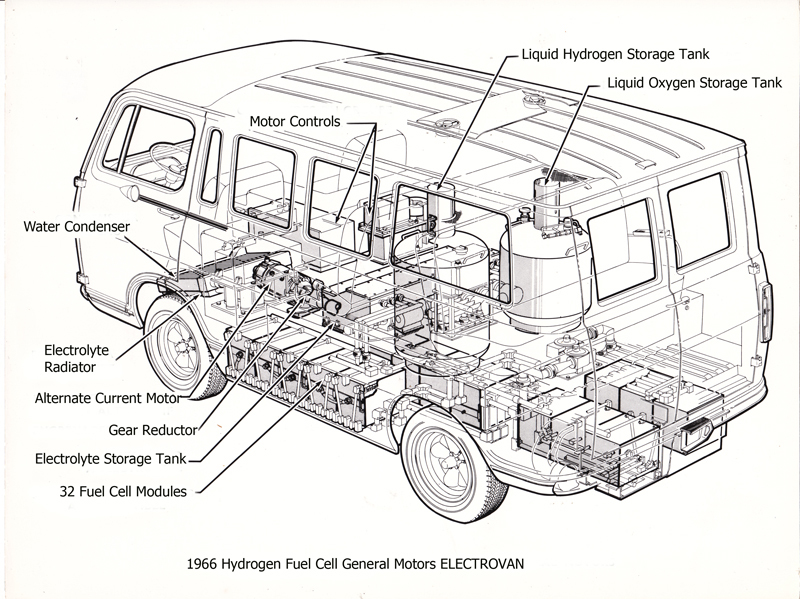 A General Motors van was selected for this exercise and resulted in the ELECTROVAN, the first hydrogen fuel cell vehicle ever introduced to the public. The idea of the fuel cell technology was defined in 1839 but it is for the NASA space programs that operating fuel cell were completed. The space program rocket propellants were liquid hydrogen and liquid oxygen ; hydrogen fuel cell allowed sufficient electricity on board when battery capacity would not be sufficient. 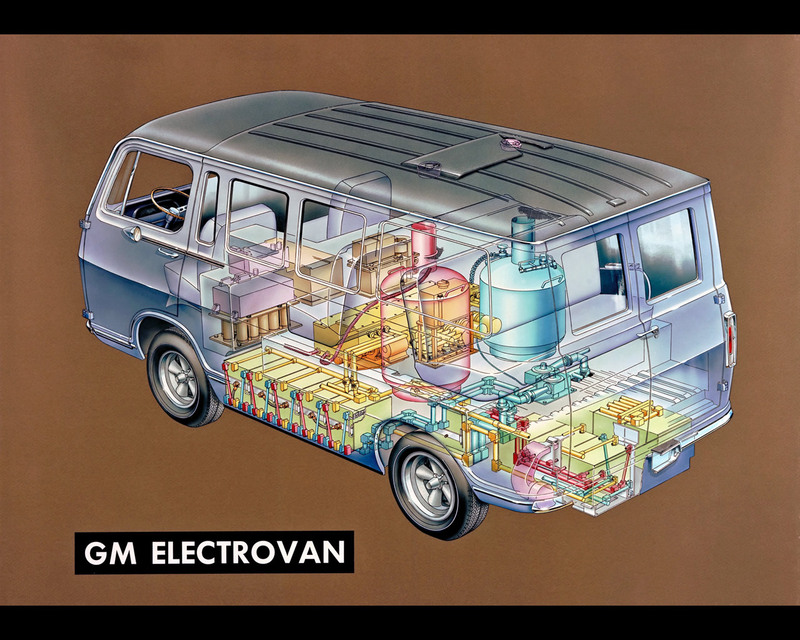 The fuel cell technology for the General Motors ELECTROVAN was developed with Union Carbide. Union Carbide had spent several years developing fuel cell technologies. Union Carbide was also in industrial gases, in particular liquid hydrogen and liquid oxygen which allowed sufficient capacity. Liquid oxygen and liquid hydrogen must be stored in vacuum-jacketed cryogenic storage vessels due to their extremely low temperature. In the fuel cell, when hydrogen and oxygen combine they produce not only electricity but also heat and water. Dr. Craig Marks, Assitant Engineer in charge of Power Development Department, explained in his speach that one of the tricks of the trade was to produce that water where you wanted it. "We found that there are a lot more places where you don't want it than where you do. We also found that these fuel cells don't start up and shut down with the turn of a key. When we decided to graduate for larger systems we learned a whole new set of things." A lot of development works would still be needed for the completion of a reliable vehicle with smooth operation. The ELECTROVAN weights 7100 lbs. ( 3220 kg) with 3650 lbs. (1655 kg) power train weight while gasoline GMC VAN weights 3250 lbs. (1474 kg) with 870 lbs. (394 kg) powertrain weight. 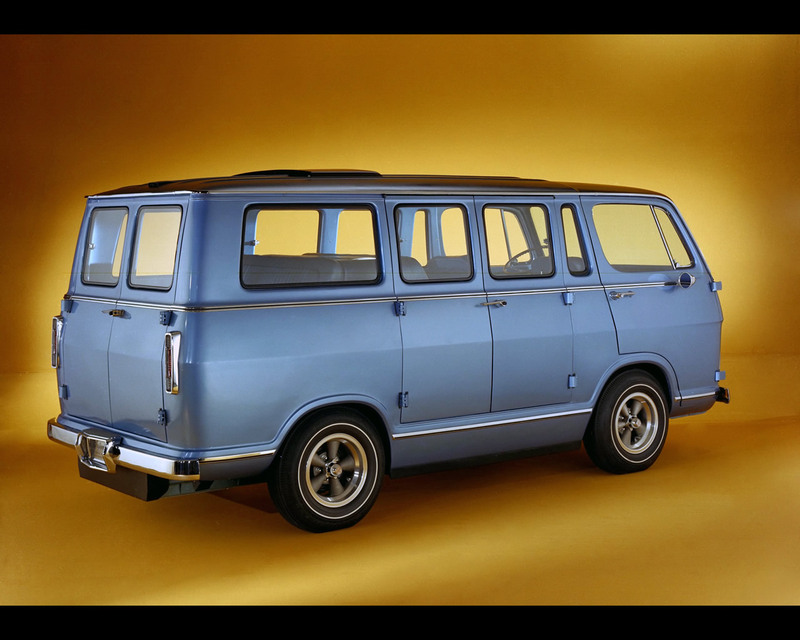 The acceleration of the ELECTROVAN is announced at 0-60 mph (0-96 kph) in 30 seconds while the GMC VAN requires 23 seconds. Top speed are similar with 70 mph (112 kph) for both vehicles. The ELECTROVAN range is quoted between 100 (160 km) and 150 miles (240 km)with full storage tanks. Concerning the purpose of this research and development program, Dr. Lawrence R. Hafstad, Vice President in charge of General Motors Research Laboratories mentioned "The principal reason for the current revival of interest in the electric car is its promise to contribute to the reduction or elimination of air pollution." He insisted that intense research was undergone to reduce the pollutants emission of the gasoline engine at the time but that this required additional hardware and that the crucial element is the cost of the added hardware compared to possible alternate solutions like the electric car. At the time power electronics did not exist and solid state components made electric controls bulky, costly and heavy. Dr. Craig Marks, on the other hand, explained in his speech the electric drive conceived by Delco Division beyond the battery pack and the electric motor required several additional hardware* to operate the electric motor. These include Inverter Modulator, Trigger Box , Logic Box, Voltage regulator and an oil cooling system to control the temperature of the motor and the electronic controls. 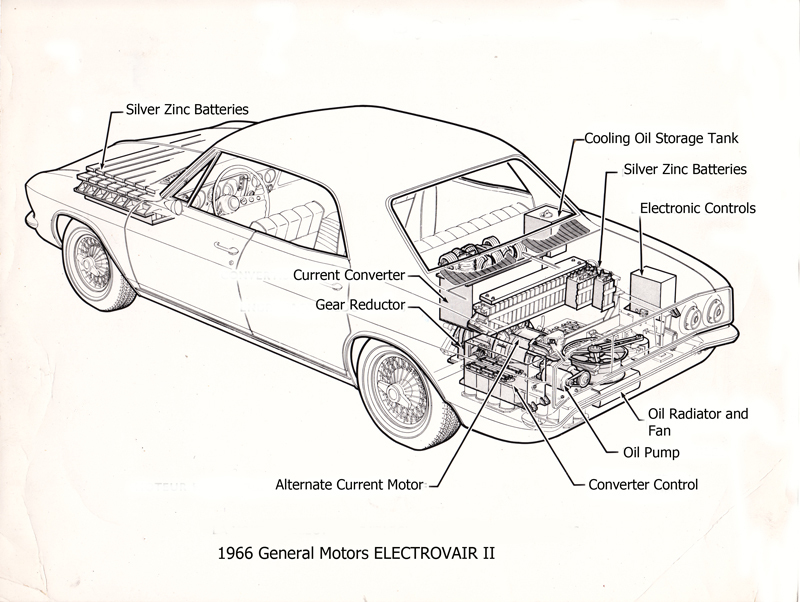 All these elements have been incorporated in the ELECTROVAIR and the ELECTROVAN since the main difference is the energy source. The ELECTROVAN as well as the ELECTROVAIR are experimental prototypes that could be tested only on private roads as safety homologation remained to be addressed. 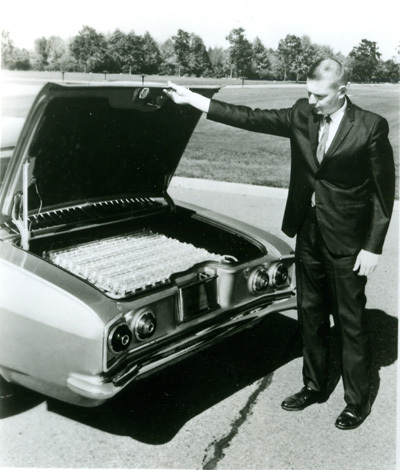 The public introduction of these electric cars in October 1966 at the GM Technical Centre was really a milestone. General Motors would introduce a Zero Emission battery electric automobile on January 3rd 1990 at the Los Angeles Auto Show with the GM Impact. The Impact' system were extensively tested and in 1996, the Impact became the limited production EV1. Over 1000 units were produced and leased to customers in California and the Southwest. The EV1 still had limited operating range and required some time for recharging. In 2007, General Motors introduced the Chevrolet Volt. The heart of the Volt is the Voltec electric propulsion system, which combine battery-only electric driving with an efficient gasoline engine oper ating an on-board electric generator giving the Volt up to 379 total miles of driving before having to recharge the battery or fill up the small gasoline tank.
. In July, 2013, GM and Honda announced a long-term collaboration to co-develop next-generation fuel cell and hydrogen storage systems, aiming for potential commercialization in the 2020 time frame. 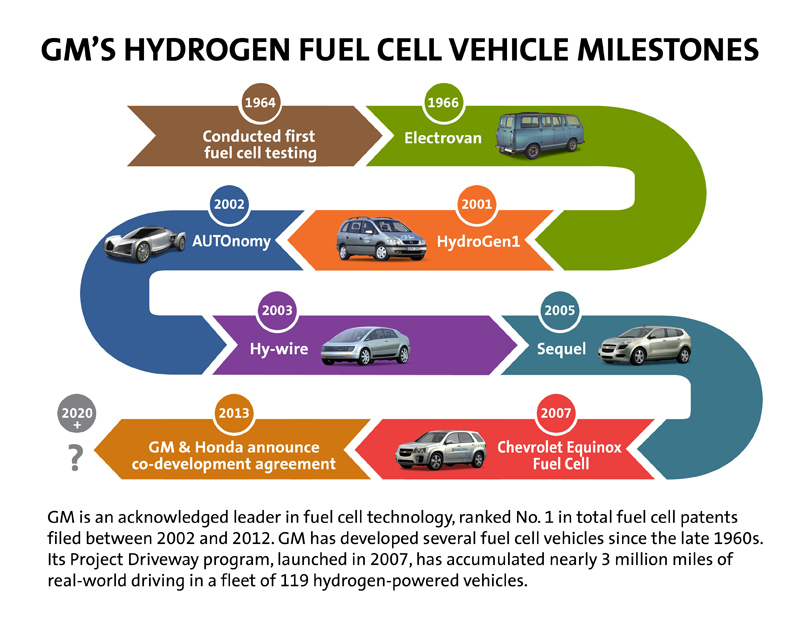 By May 2014, General Motors’ fleet of fuel cell vehicles recently passed 3 million miles of hydrogen-powered, real-world driving. Some individual vehicles have accumulated more than 120,000 miles. By GM’s estimate, using hydrogen to power these vehicles, the fleet has avoided 157,894 gallons of gasoline consumption. In 2015, Toyota and Hyundai introduced the first hydrogen fuel cell automobiles on markets where hydrogen filling infrastructure is starting to appear, that is Japan, California, U.S.A., Sweden, Germany or the United Kingdom. General Motors is expected to introduce its hydrogen fuel cell solution by 2017 together with other major car manufacturers. AC induction motor was selected to power the car and the van. The induction motor is a very rugged machine which can be run at high speeds. This one delivers about 100 hp and runs up to 13000 rpm. The motor designers at Delco Products Division did an excellent job as the motor weighted only 1.3 pounds per horsepower. Dr Craig Marks explains:" Somehow we have to change the direct current power available from the battery pack or the fuel cell into alternating current power for that induction motor. This is the job of the high power switching equipment which varies both the voltage and frequency of the power in just the right way to run the motor. This unit requires 18 of the most advanced silicon controlled rectifiers available, to handle the high currents in the shortswitching time available at 13000 rpm. Unfortunately, though, these high power switches can be on but not off, with a small pulse of power. To turn them off, we require a set of capacitors which are alternately charged and discharged to blow the switches out. And the second block of capacitors is needed to smooth out the power flow to the motor. Next, we have to provide signals to turn those high power switches on at the proper time. This is the job of the low power trigger controls. They produce a pulse of energy which must peak in less than one microsecond or else the silicon controlled rectifier will burn itself up. And next is the logic box which translates the driver's control from the ignition switch, the gear selector, or the accelerator pedal, into the proper signals to develop more power, less power, reverse the motor, or whatever is demanded. This box also contains the electronic safety circuits. Our last electric system is less sophisticated; it simply supplies the power required for lights, horn, windshield wipers, and the various other accessories. These receive power from a conventional battery. Finally, we need an oil cooling system, since our motor and electronic controls are not hundred percent efficient. The motor and controls are very compact and handle very high currents. Therefore, they must be cooled by circulating oil through them, and then through a radiator, which is cooled by air with a fan and motor.